There were 136 titles released for the Atari 2600. Here are the 25 you need to play. On Sept. 11, 2017, the Atari 2600 turned 40 years old. Hitting shelves at a hefty $199 price tag—about $786 adjusted for inflation—the 2600 came with a single button joystick, a pair of paddle controllers, and a game. The system’s lifespan is hard to fathom in modern times, selling from 1977 until Jan. 1 1992. While the modern game systems refresh every few years, the Atari 2600 was a presence in stores for 13 years. The Atari’s longevity is mostly thanks to its deep catalog of games, ranging from adventure titles to action games, and movie tie-ins. Despite, or perhaps because of, its limitations, Atari developers found new and exciting ways to stretch the system’s limited capabilities into fully realized games. While they may seem crude by today’s standards, the Atari 2600 help usher in the modern era of games whether current players remember it or not. Don’t believe us? Take a walk down memory lane with our picks for the best games on the Atari 2600. The original king of rage quitting, Pitfall! is the rare 2600 title that remains on the lips and minds of gamers around the world even more than 30 years after its release. Combining an infuriating difficulty level with a 20-minute time limit, Pitfall! helped define the side-scrolling platformer for generations to come. From swinging on vines to falling through holes to new levels, we’re still playing with mechanics Pitfall! introduced. Take off your hat and show some respect. People scoff at the 2600’s admittedly limited capabilities, but in the right hands, the system could produce remarkable things. Battlezone stands as the systems finest graphical achievement, one of the earliest examples of a first-person shooter, complete with 3d graphics. Battlezone is still fun today, a feat made all the more remarkable when you consider its 1980 release date. Berzerk’s multi-directional shooting action has helped cement its legacy as one of the Atari’s finest action titles. Maze games were common in the system, but Berzerk added a shooting component that took its simple mazes to another level. The Atari 5200 version is among the first home console games to feature digitized speech and has been lovingly referenced in everything from News Radio to The Simpsons. On a darker note, Berzerk is also the first game to be tied to the death of a player, when an 18-year-old game had a heart attack after achieving two high scores on the game in 15 minutes. Atari’s answer to Legend of Zelda wasn’t a fantasy game, but instead a science fiction title. You are an unnamed hero tasked with blowing up eight space stations using a blend of simple sword-based combat and brain-bending puzzle solving. At the end of each level, you set off a detonation timer, forcing you to quickly find a teleporter or face your doom. Secret Quest is beloved for its Easter eggs, including a hidden stats menu only accessible by flipping the system’s “black and white” color switch. Looking for the height of Atari two-player military combat? Look no further than Combat, a land and air combination that ruined plenty of friendships over countless fevered battles. Tank levels see you navigate simple mazes as you seek to destroy your enemy, while the biplane and jet levels take you to the clouds for aerial warfare. With 27 variations of its three level types, Combat was a diverse game that pushed its simple format to the limit. This vertical-scrolling shooter was a massive hit for Atari, selling over a million cartridges. Players control a fighter jet that can move right to the left, but not forward or back, as it blows up enemies and seeks out precious fuel reserves. River Raid remains a blast to play, thanks to its varied level design and challenging refueling requirements. One of the biggest games ever released for the 2600, clocking in at a (for the time) massive 32KB, Fatal Run is an oddly dark sci-fi racing game that tasked players with transporting a radiation vaccine to a dying populous. Your simple task is complicated by other racers who want to run you off the road and into the grave. Fatal Run was one of the rare titles for the 2600 to feature a password system, but after you’re blown up for the hundredth time, you’ll be thankful it has one. Pong technically never came to the Atari 2600, but there were plenty of games in its spirit. Outlaw was the best: a shootout themed riff on the classic hockey game that saw players trying to ricochet bullets around a map in hopes of killing their opponent. While the single-player component is a blast, Outlaw’s two-player mode is where it cemented its legacy. Atari’s 1978 Basketball was one of the few early titles to feature a single-player mode with an AI-controlled opponent. Games last four minutes, with players being granted eight directions to move using the joystick. Each player could steal the ball from their opponent while they’re dribbling, adding an extra layer of strategy to the title. While its graphics look awful by today’s standards, Basketball’s gameplay holds up after all these years. It would be criminal to leave Space Invaders off this list—even if it wasn’t all that fun. The title was the first licensed arcade game to come to a home system. It’s credited with quadrupling sales of the 2600 and selling over 2 million copies in its first year. While the Atari version feels slow in comparison to the lightning-fast editions we’ve come to love since, Space Invaders stands as a champion in the annals of Atari history. Kaboom! Is a simple bomb-catching game, but its simplicity hides some deceptively addictive gameplay. It’s easy to sit down for a game, then find yourself an hour later on your sixth play through. Players try to catch bombs in three buckets as explosives are tossed by a madman. For every thousand points you get another bucket, and if you should ever reach 10,000 points, you get to see the mad bomber’s expression change. Kaboom! featured one of the first public high-score events. Players who scored over 3,000 points could take a picture and mail it into Activision in exchange for membership in the Activision Bucket Brigade and get a Bucket Brigade Patch. We wish more games now gave out merch for high scores. Atari games weren’t known for their darkness, but Atlantis has an oddly grim premise. You are tasked with manning the defenses of the legendary underwater city, only you can’t move your guns. Instead, you can only aim from fixed points, hitting enemies when they come close but often being left defenseless at the worst moment. The game ends when your city is destroyed, and no matter how well you play, eventually the city falls. The Last of Us might haunt modern gamers’ dreams, but Atlantis taught an entire generation of Atari fans about the futility of war. While many 2600 games were ahead of their time, Adventure is notable for introducing features we’ve all come to take for granted. Enemies move around the world even when they aren’t on screen? That’s Adventure. A playing area made up of multiple different screens? Sorry, Zelda, you owe Adventure a cap tip. Players explore a giant (for the era) castle full of dragons and bats in search of keys and hidden rooms. The game also introduced three levels of difficulty, each causing the mazes to become more complicated and items to be randomized. Asteroids’ simple gameplay made it a classic from the arcade to the home console, but the 2600 version is a work of art. The first game to utilize bank switching to increase the amount of space on a cartridge, Asteroids was a massive 8KB compared to the standard 4KB games of the time. Playing with a joystick on modern systems is fun, but if you want an authentic experience, make sure you play using the Atari’s paddle controllers. There’s nothing like quickly spinning in space to blow up a deadly asteroid at the last second, even decades after the game’s release. Atlantis may have preached that war is unwinnable, but Missile Command proved that even when you can win, succeeding is hard as hell. Players are tasked with destroying incoming attacks from outer space using one of six missile battalions. Your ammo is limited but replenished at the beginning of each level. This port of the popular arcade game became the third-most-popular Atari game in history sales-wise, and its addictive gameplay makes it clear why. It’s still a blast today. By today’s standards, Yars’ Revenge is overly simple, essentially boiling down to one boss fight. But, viewed through the lens of a game released in 1982, this strategic shooter is important to remember for its powerful boss who could change forms to attack in new and frustrating ways. In a world enamored by Cuphead, it’s important to remember the original pain inflicted by the morphing villain. Pour out your cup for Yars, may his nemesis Qotile rot in hell. Swordquest was a wildly ambitious series that sadly never saw completion thanks to its over-the-top ad campaign and complicated gameplay. Players could solve puzzles within the game to win real-world prizes, valued at a total of $150,000. While this wild marketing gimmick has overshadowed the title’s gameplay in the years since, Swordquest is a remarkable, fully realized game. Using logic puzzles and furious (for the time) action sequences, players explored a magic castle, transporting items between rooms and uncovering clues. Deeply confusing at times and overly ambitious, Swordquest is an example of how far the 2600 could be pushed in the right hands. Late in the 2600’s lifespan, the system began to struggle with its limitations, from processing power to its one-button joystick. Kung Fu Master, a port of the arcade smash, shows how developers began to work around those weakness to bring exciting and faithful recreations of more complicated titles to the system. Players run, duck, jump, and punch their way through waves of enemies that come from all sides of the screen. Facing off against dragons, ninjas with boomerangs and throwing knives, and powerful fighters who can take multiple hits, Kung Fu Master feels like a full on Nintendo game packed in a tiny Atari package. Long before Wing Commander was even a thought in someone’s mind, Star Raiders was setting the standard for intergalactic space combat. Released in 1979, this fully realized game introduced an open world complete with enemies to hunt down and friendly bases to discover. Players maneuver through the world via the Galactic Chart, which divides the map into sectors, each of which can be hyper warped into. The hyper warp sequences of the game get more difficult as you progress, eventually requiring you to steer your ship during each segment. Star Raiders should be remembered as a classic for its forward-thinking first-person shooting mechanics, but when you take into account the depth of its world building and exploration, Star Raiders is more than a classic. It’s a seminal piece of video game history. No Pong clone was as cruel as Super Breakout, and none was more beloved. Your goal is to keep a series of balls from falling off the screen, bouncing them against a slowly exploding wall with your paddles. This lightning-paced single-player puzzler offered three complicated game modes. “Double” gave players two paddles stacked on top of each other to deflect the ball. “Cavity” hides two extra balls within the walls of the level that you must free for extra points. Finally, “Progressive” gives players with a single paddle and ball to destroy a slowly encroaching wall before it kills them. Unlike many Atari titles, Super Breakout lives on today, in millions of cell phones and consoles around the world. It would be easy to overlook Demon Attack as your standard space shooter clone if it wasn’t for the ingenious way it casually ramps up the difficulty as you progress through its levels. Each wave of enemies introduces new demon attacks and weapons, including now-beloved shooter standards like spread attacks and long laser blasts. While the action occasionally gets repetitive—it is Atari after all—Demon Attack is a classic. The fact that Tempest is one of the first three-dimensional games for a home system is enough to earn this creative shooter a place on this list, but the game’s legacy doesn’t stop there. It’s also one of the first video games to feature changing progressive levels instead of merely having gamers play the same level over and over at a higher difficulty each time. In Tempest, you’re a space pilot shooting lasers down a series of corridors, equipped with standard blasters and a limited-use super weapon. Enemies get harder as the game progresses, leaving traps for you and speeding up across Tempest’s 16 geometric levels. While Goldeneye 64 ruled slumber parties in the late ‘90s, Warlords was the four-player game of choice in the Atari era. By plugging in multiple paddle controllers, up to four players could face off in a game of death. Your goal is to deflect a ball into your enemies castle before it can damage your stronghold. The gameplay is simple yet addictive, especially when you’re playing with actual people and not the computer. We can only imagine the friendships this ruined when it came out. Never send a man to do a woman’s job. When the original Pac-Man was released for the Atari, it was a disaster. The game was rushed, leaving developers little time to master the differences between the Atari and the original arcade hardware. It sold millions, but its legacy is awful gameplay and terrible graphics. Ms. Pac-Man fixes all of those problems. It’s fast-paced, gorgeous even today, and surprisingly easy to control. The Atari often struggled to translate arcade to the home console, but when developers were given time to do it right, the results, as evidenced by Ms. Pac-Man, speak for themselves. Frogger is addictive as hell, as anyone who has ever played the game in an arcade or watched its Seinfeld episode can testify. On Atari, Frogger came in two flavors, original and Starpath. You’re going to want to hunt down the Starpath version. The original game is a mess, full of dull flickering colors and ugly gameplay. Starpath’s version utilized a device called the Supercharger, an add-on that gave the 2600 a massive 6KB of extra space and improved RAM. This isometric platformer is best remembered for its classic arcade cabinet, but the Atari version of Q*Bert is one of the most consistent ports to ever hit the console. You play as a fleshy alien named Q*Bert, helping jump around tiles on the map to change their color before a monster eats you. As you play, tiles need to be hit more times to reach their final color, and the enemies just keep coming. Despite its odd take on 3D gameplay, Q*Bert runs lightning fast on the system, creating a stressful maze game where your true enemy is your limited paths around the map. The graphical limitations of video game systems in the ‘70s and ‘80s had the effect of igniting developers imaginations in ways we’ll probably never fully understand. Since their systems could barely reproduce accurate reproductions of character designs, they were allowed to run wild with their ideas. 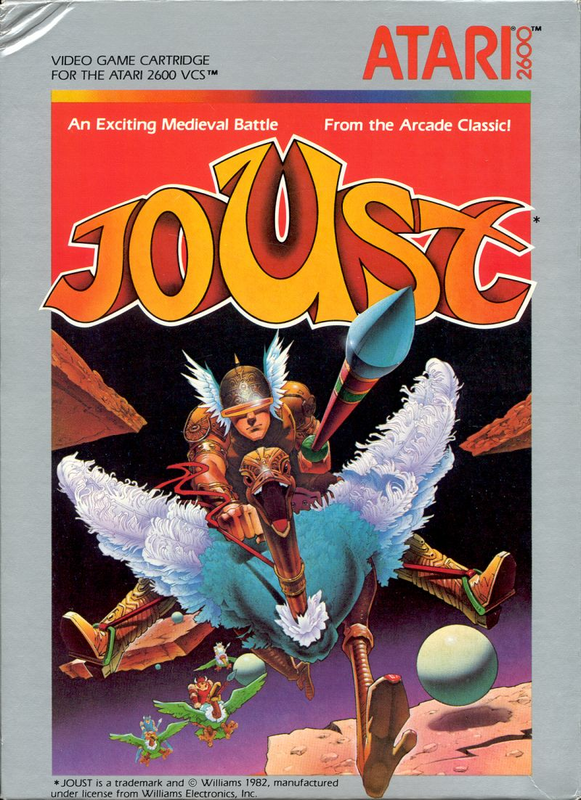 Exhibit A: Joust is a game where you play as a knight riding a flying ostrich, fighting other knights who are also riding flying ostriches. You navigate your ostrich through platforms, jumping and attacking in the hope of killing your enemies before they kill you. The gameplay is addictive, but the box art as remains among the best in game history. No game for the Atari 2600 let you feel more like James Bond than Spy Hunter, a land and sea shoot-’em-up that saw players fighting enemies in traffic from their amphibious assault car. The original Spy Hunter came with a special joystick grip that allowed you to play with two joysticks at once, allowing for multiple firing modes while working around the Atari’s one-button limitations. The only problem is finding these grips are almost impossible these days, leaving Spy Hunter best played on emulation software even if you can hunt down a cartridge. Gamers fight endlessly over what counts as the “hardest games of all time,” but any conversation on the matter that doesn’t include Raiders of the Lost Ark is incomplete. Utilizing two joysticks, one for movement and one for items, Raiders forces players into complicated logic puzzles in an era where players were almost never expected to solve logic puzzles. Think of how often you fall back on previous experiences in other games to solve a puzzle in a new title. Raiders players had no such advantage, forcing them to discover how to hide from snakes, navigate rooms, and use items with almost no help from the developers. It would be infuriating if it wasn’t so much fun. It would be a stretch to call Texas Chainsaw Massacre a good game by modern standards if you’re looking for complexity. But in terms of sheer fun, few titles on the Atari 2600 ever reach the bonkers joy of this absurd classic. You play as the flesh-adorned cannibal Leatherface, hunting down teens, dodging wheelchairs and snakes, and carefully managing your fuel reserves. After all, you don’t want to run out of gas while you’re chopping through teens. It lacks variety, but that doesn’t matter in the face of its silly and fun gameplay.